Antalya Convention Bureau is established by Antalya Promotion Foundation and gives its efforts for the city under the patronnage of Antalya Chamber of Commerce & Industry and it is a non-profit organization. The aim of the Antalya Convention Bureau is to promote the congress potential and facilities of Antalya on national and international levels. Antalya has a rich cultural heritage with many remains of an outstanding history. Because of its natural advantages over the centuries different cultures have choosen the area and left their marks, today’s ingredients of a welcoming, open-minded and still tradition-bonded city. 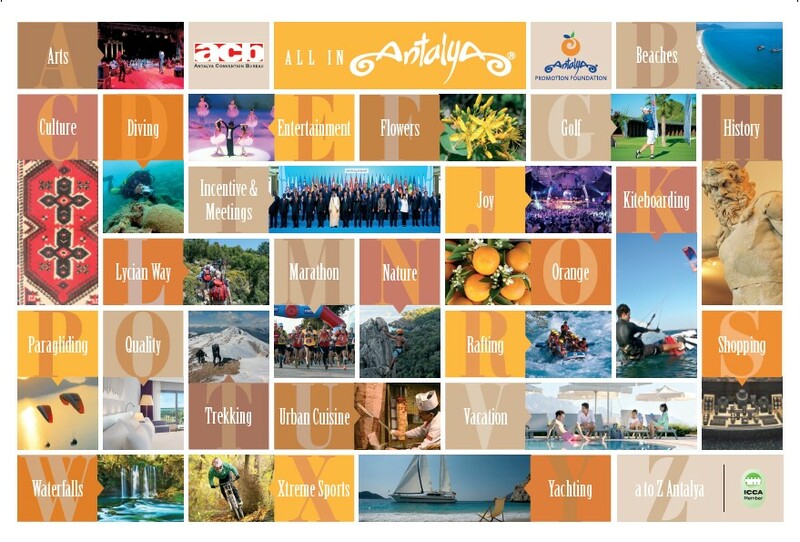 The ACB represents Antalya at important tourism and MICE fairs and is member of ICCA. With its new and well equipped hotels and their convention facilities, Antalya is an interesting choice for the international congresses, conventions and incentives. In Antalya there is also a unique concept offered to the delegates: an all-inclusive offered by a hotel or resort, where almost all expenses are included in the price. Antalya Convention Bureau and Antalya Congress Industry are committed to support and encourage sustainable practice, including the hosting of environmentally friendly "green" meetings in Antalya.